Apple Computer Inc. Chief Executive Steve Jobs introduced an eagerly anticipated iPhone with a touch-screen that combines features from the popular iPod music player. Read the story and watch the video at CNN Money. A lot of pictures available at engadget. Look for the keylock at the first pic - how cool is that?!?!? iPhone is less than a half-inch thin -- less than almost any phone on the market today. It comes with a 2-megapixel digital camera built into the back, as well as a slot for headphones and a SIM card. 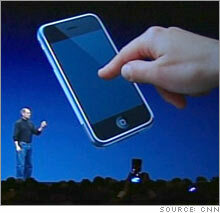 The phone is 11.6 millimeters thick with a 3.5-inch-wide touchscreen and a 2-megapixel camera. The device integrates functions of Apple's popular iPod music and video players and has 4 or 8 gigabytes of storage.